The impetus for the program came from those very same clients … they were experiencing such significant changes from Visual Coaching and SHIFT-IT, that they wanted me to explain in more depth the magic behind it all, and empower them to use my methods and tools with their own client base (as many were Process Professionals who worked with individuals too). So, I did that … Visual Coach Certification was born. Over the past six years many additional innovations and advancements have occurred. So this year, I’ve enhanced the program, to make it even more useful to you. I’ve now added 13 more maps, bringing the total maps included to 30. The new maps include more visioning tools, more law of attraction tools (energy alignment), a powerful orphan rescue protocol (a soul retrieval technique that I use constantly in my own practice) as well as a basic map to assist with ongoing implementation with your regular clients. For more info on these new tools, click here. P.S. If you are already one of our 50 Certified Visual Coaches, please know you get these new maps too! We’ll add these new tools (and their training modules when complete) to your Graduate Area. As a valued grad, you receive any additional maps added to the Program in the future too! SHIFT-IT is an excellent process and suite of tools, however there are many ways to coach and work with individuals beyond how I do it. 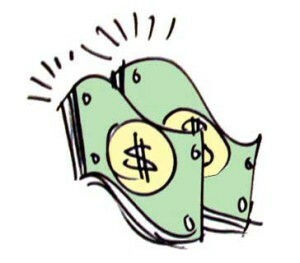 As such, I allow the creation and use of your own Visual Tools to count towards your client hours. And provide detailed guidance, support and structure to help you create them sooner rather than later … you save time by tapping into my 20+ years in the Visual Process Field. As I’ve written in other articles, Visual Coaching, this specialized niche within the larger Visual Process niche … is gathering momentum every year. In part, this is due to advances in technology and even generational and societal evolution too. Overall as a species we are increasingly using various kinds of visuals to more effectively scan and process info. Now with improved web conferencing and digital writing/drawing devices we can mimic the interactive effects of working in-person with paper on the wall. Working virtually can radically increase the geographical range of your practice. Where I was once limited to working with local clients or with those who could travel to me, now I work virtually with clients from clear across the English Speaking world … North America, Europe, Australia, New Zealand, Asia … even Africa! As long as we can find a time that works for both our time zones and the client has a robust enough internet connection. In Certification, we are increasingly discussing the tricks and tools for working virtually. 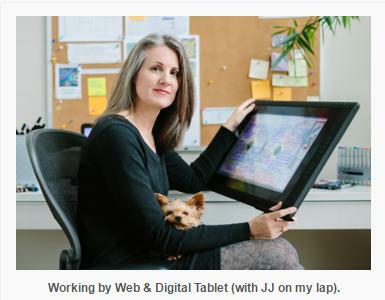 I share what I’ve learned over the years, including my current hardware and software of choice. New technology is emerging every day it seems so we also discuss new advances as they appear and info share within our suave cohort. Developing your visual chops is only half of the equation. The other half is having a place to apply your skills and being paid for then, if you want to be. Some Visual-Coaches-in-Training are already employed within various kinds of organizations. Others are independents, either seasoned ones who’ve made the leap to ‘free agent nation’ long ago, or folks inching into or pushed into that transition. Whether you are internal or external, you still need to get clear on your identity/brand regarding the visual way of working and learn how to language and market your offerings. 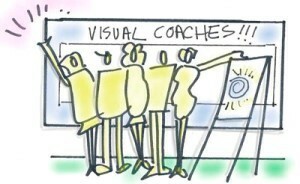 Visual Coach Certification already includes one Business Development Module (near the end of the training phase). However, for Combo Package purchasers, I’m now including Business Essentials for Process Professionals … a thorough 10-Module Home Study Kit. P.S. 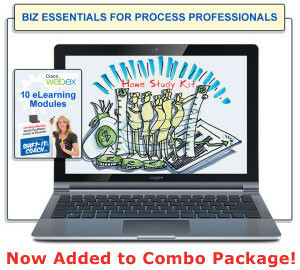 If you secured the Combo Package previously, write us for access to Biz Essentials for Process Professionals as my guest. I’ve also expanded the amount of personal attention and ongoing structure you receive, particularly in the Self-Paced Stage of this program. You now receive 3, 30-Minute private coaching sessions (to discuss anything you wish to discuss in a private container). And, 4 mandatory 90-Minute Community Webinars in September, October, November and December. 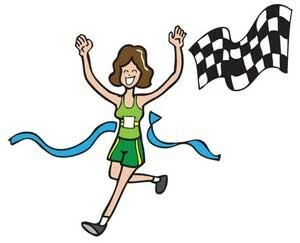 So you are fully supported right through to submission of your Exit Exam. 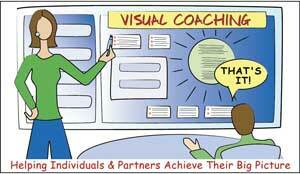 Visual Coach Certification attracts various kinds of Process Professionals with various needs. Most are coaches, counselors and therapists however there are other professions that work with individuals where the Visual Tools and methods come in handy too (disability specialists, financial advisors, lawyers, mediators, etc.). For some of these professionals the language of ‘coach’ and even ‘visual’ isn’t the best fit for them. Therefore I now offer a secondary more generic logo of “Certified in SHIFT-IT Maps”. Both are available to you upon graduation. Expanded Combo Package: Take Up to 2 Years to Complete! This is a really solid program, especially considering there are two pre-requisites required too: Fundamentals of Working Visually (or equivalent experience) and SHIFT-IT (either with me or one of our Certified Visual Coaches). Keeners who are inspired and motivated can move through the complete program relatively quickly (covering both the pre-requisites and the Certification itself in less than six months). However other folks require more time to fit this Certification into their other commitments. Within the Combo Package, I’ve expanded the range of course selections from one year to two. Pick what works for you. Some of you may have been eyeing Visual Coach Certification® for some time. And you made a decision way back when to do the ‘piecemeal’ approach … taking each course separately rather than securing the Combo Package at that time. Important Note: Given I’ve made some significant enhancements to this program, I’ll allow ‘grandfathering’ for those of you would like to transfer your recent separate course purchases into the Combo Package. If you took ‘Deluxe Versions’ of any of the courses, the private coaching portion is not eligible (however the rest is). Just email admin@shift-it-coach.com to see which of your previous courses apply. Visual Coach Certification 2016 is gearing up to be a very exciting program. We start April 5th. For those who are a match, be seeing you soon! 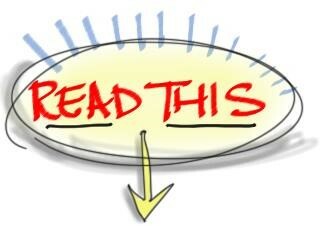 So excited about these new enhancements and the growth that Visual Coaching is experiencing in the world! 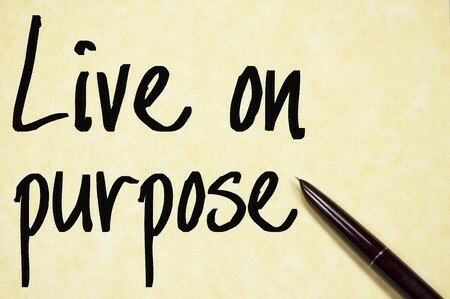 Together we are helping SHIFT individuals and the world at large, and ourselves too of course!